Unfortunately, Milwaukee couldn’t answer the bell for 2010. Hopefully, ‘The Mile’ will be back on the schedule next season. This year, however, instead of a one-mile, flat track, we headed to the most intimidating, highest-banked, pucker-inducing track on the schedule: Texas Motor Speedway. 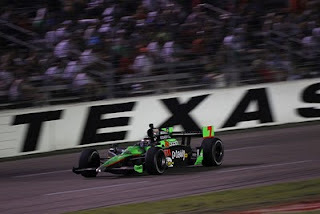 With Texas being a Saturday-night race, it was a very quick turnaround for the teams after the Indy 500, and that impacted several teams that had “issues” at Indy. De Ferran Dragon, for example, had planned to run both Rafa Matos and Davey Hamilton at Texas. 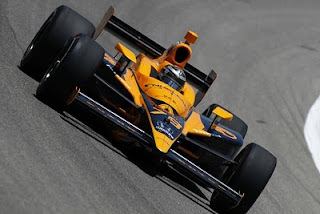 But as both drivers crashed out at Indy – and with the team having only two cars – it was a VERY busy two days at the little shop just south of the Speedway, as the small team thrashed hard and late into the night to get just one car ready for Matos at Texas. They got it done – just. Hamilton would have to watch from the sidelines, and returned to the network radio booth. Additional post-Indy fallout included the departure of co-owner Jim Freudenberg from the impressive new FAZZT Racing effort, the result of continuing concerns on the sponsorship side of the team that resulted in primary owner Andre Azzi having to write a couple of large checks to cover expenses. Team Manager Rob Edwards has assumed Freudenberg’s duties, and can hopefully get things turned around on the commercial side, as, on the actual competition side, this has been a very impressive new team, punching well above its weight with Alex Tagliani driving. Mike Conway, of course, was not so fortunate, but he was released from Methodist Hospital in Indy on Friday, June 4, and is back home recovering from his broken leg and fractured back. He’ll be out of the cockpit for at least the next three months, but should recover fully. 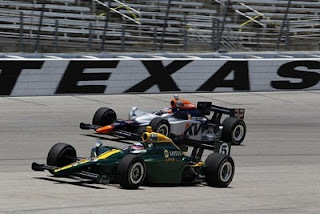 The opening practice session saw a lot of typical Texas two-wide running, as drivers were trying each other out and seeing how cars would handle with rubber building up on the high side. As a result of all the drafting, it was a curious time sheet at the end of the session, with the likes of Milka Duno in sixth (! ), four spots ahead of Helio Castroneves (!!!). Overall, the gap was just .4222 seconds from the quickest (Scott Dixon) to Mario Romancini at the back of the 26-car field. With an abbreviated, two-day race weekend, this would be the sole practice before qualifying, with the second practice, early Friday evening, being used for race setup prep. Oh yeah, have I mentioned that was typically Texas HOT over the weekend. Mid-90s ambient, a cool, comfortable 60+% humidity. Qualifying wrapped up with the usual suspects P1-P5 (All Penske/Ganassi, All the Time). Ryan Briscoe went from zero (crashing out at Indy) to hero by qualifying on the pole for The Captain, followed by the rest of the Gang of 5: Franchitti, Power, Dixon and Castroneves. Yawn. But then it got …. Interesting. In P6 was none other than Alex Lloyd, driving for Dale Coyne Racing. Over the winter, Coyne lost a lot of talent, both behind the wheel (Justin Wilson to Dreyer & Reinbold) and behind the pit wall (engineer Bill Pappas to KV). 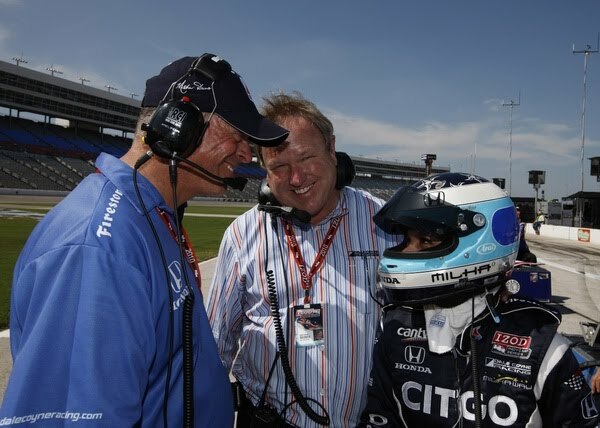 But, in typical Dale Coyne fashion, he’s found a way to bounce back, first by adding Alex Lloyd as driver for the #19 Boy Scouts car and, starting at Indy, veteran team manager/engineer Mitch Davis as – naturally – team manager/engineer. The results were almost immediate: an excellent fourth-place run at Indy, followed by a sixth-place (and “first in class”) qualifying effort here. A couple more tidbits from qualifying: Hideki Mutoh slotted in a strong seventh, as he continues to fit in well at Newman Haas; while Danica was eighth and the fastest of the Andretti cars. But overall, the AA cars still continue to struggle in oval qualifying sessions. The race (just check out the Indy results) is usually a different story. Mutoh’s countryman, Takuma Sato, put in another solid qualifying effort, quickest rookie and 11th overall. The final practice, as expected, saw everyone packing up. And if a driver didn't naturally wind up in a pack, he/she would slow until she/he got caught by one. At one point, it looked like about 15 cars were hooked up together. All exciting/scary to watch, but all necessary to prepare for 228 laps around the place on Saturday night. Forget the final practice times, they’re basically irrelevant in the pack. It’s all about how the car handles in traffic. Does it want to understeer “up the hill” when running closely behind someone (bad car!) or does the back end want to pass the front when someone else pulls alongside (VERY bad car!!!). How much added wing is needed to keep it planted? How hot will it be at the start, and how much will it cool down as the race progresses? How many cautions are expected? Decisions, decisions. These are what keep the engineers (and many drivers!) up even later at night here. Remember that the IRL changed the rules last year to allow teams to run different downforce levels. And we saw just that at Texas. There was a mixture of teams using or not using the "wheel ramp" (I think that is what it's called) that extends from the top of the sidepod to a point just in front of the rear tire. It also ends just above the "kick-ups" that attach to the undertray and are again just in front of the rear tires. Obviously, this produces different downforce levels. More decisions. And on to Race Day we go…. 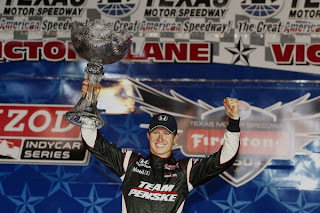 Ryan Briscoe came back from finding the wall at Indy to victory in Texas. The race was really good, with typical Texas pack racing through the first two stints. At the end, it turned into just a bit of a fuel-mileage deal, stringing out the field for the last 30 laps or so, but the fastest car and driver won – and boy, did Roger Penske look uncomfortable wearing a cowboy hat in Victory Circle! Danica Patrick came back from boos at Indy to huge cheers in Texas. She was there or thereabout all night long, but owes teammate Tony Kanaan a big one after inadvertently chopping him BIG TIME during some mid-race cut-and-thrust. Still, she got the crowd on its feet and cheering. She briefly took the lead after the last green-flag stops, but there wasn’t too much doubt that Briscoe would come back strong after his final stop. Still, an excellent run for “Miss Sparkle Pony” (Tommy Kendall’s nickname for her), and at exactly the right time. Also getting well-deserved cheers was Simona de Silvestro, who kept her cool when all about her were losing theirs. Simona started at the back of the field, as her team never messed with a qualifying setup, just focused on running her in traffic in practice. In the race, she moved up to mid-field early on, but then her car went loose and she tried to carry on at the same pace – only to learn just how bad an idea that can be. As was inevitable, she finally dropped it in Turn 2, slapped the wall and then went for a Texas-style slide all the way to the exit of Turn 3 - with the ride side on fire the whole time. But the rookie kept her wits about her – even as the normally excellent safety team dropped the ball big-time (see “Zeros” below) – and came out of the deal with only minor burns on her right hand and a whole bunch of new fans. Tony Kanaan, Ryan Hunter-Reay and Marco Andretti all make the “Hero” list, as once again Andretti Autosport suffered in qualifying only to star in the race. Marco said the team piled on the downforce for the race so its drivers would have stable cars over a long run, and it worked a treat for all four AA cars, led by Danica in 2nd, Marco 3rd, TK 6th and RHR in 7th. 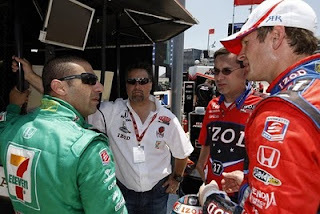 Similar to the Andretti story, Vitor Meira and Dan Wheldon also managed to turn nothing (poor qualifying runs) into something -- 9th for Wheldon and 10th for Captain Vic. They were passing cars all night long and looking racy throughout. How can you finish 4th and 5th, lead a bunch of laps, take over the points lead and still be a “zero”? Well, it may be a bit unfair, but you can’t grade the Ganassi boys on a curve. Both cars were too trimmed out, and it repeatedly cost them positions in traffic during the race, leaving them deep in the field at mid-race. Both recovered in the final laps as the pack racing broke up into single-file running, so Dixon salvaged fourth, just ahead of Dario (who moved into the points lead). But by Ganassi’s high standards, it was a less-than-successful outing. After once again showing a lot of promise in practice/qualifying, KV Racing had another tough, tough night. Takuma Sato had something break in the right-rear su spension on lap 57, sending him to the wall. Like de Silvestro, Sato hit at the exit of Turn 2, then slid all the way down the backstretch until glancing off the inside wall at the entrance to Turn 3. You don’t have small crashes in Texas…. Then, teammate Mario Moraes brought out the final caution on Lap 130. Castroneves was trying to go around Moraes in the front-stretch dog leg, but Mario moved up (NOT cool, unless you CLEARLY hear your spotter say, “clear”) and collected the Penske driver. They both hit the wall and then slid down the front stretch spinning. Bertrand Baguette was having a good race, but he just clipped Castroneves to end his night. Finally, there’s the IndyCar Safety Team, who flat-out dropped the ball in responding to Simona’s crash. This has already been hashed and re-hashed, but in a nutshell, the team was trying out a new procedure in responding to the crash (with fire hoses instead of bottles), and the first crew on the scene wasn’t sure how to react when things failed to go “according to plan”. Fortunately, the crew which arrived on the second truck understood the issue, and it was those guys who: 1) finally put a fire bottle to the fire; and 2) got Simona out of the car. But the second crew came all the way from its station at Turn 2, so there was a 30+-second delay before it arrived on the scene. That’s about a wrap, except for a couple of quick postscripts. During the week after Texas, Tony Kanaan became the first IndyCar driver to attempt Tony Stewart’s annual “Prelude to the Dream” charity dirt-track race, driving a 600 bhp “Late Model Stock Car” (trust me, it’s neither) on the ½ mile Eldora oval. It was TK’s first time ever on dirt and while he didn’t star, he certainly didn’t embarrass himself either. Give him a couple of practice days next year and he could be REALLY quick. Also, Alex Lloyd had an appendix attack on June 10, and underwent surgery that night to have the offending organ removed. He’s good to go for Iowa. Speaking of Iowa, we’re off to our only short-track race of 2010, and as (my one or two) regular readers know, I love short-track racing – even if it’s off in a cornfield, somewhere east of no where….. But hey, Iowa always gets a great crowd, and it IS a short track, so I’m all ready to go!